Bedworth is located to the north of Coventry, directly south of Nuneaton and only a short distance from Tamworth, Hinckley, Leicester and Birmingham. From Coventry – continue out of the city on the A444, past the Ricoh Arena until you reach the junction with the M6. At the M6 roundabout take the last exit, the B4113 to Bedworth/Longford. You will continue along a short piece of dual carriageway – at the next roundabout take the second exit to Bedworth (B4113). Continue along the B4113 until you reach Bedworth. At the mini roundabout (shortly after the traffic lights for Bedworth Leisure Centre) you will see The Civic Hall ahead of you, but this is a pedestrianised area – take the second exit (The Rye Piece Ringway) and then take the first left into Spitalfields Car Park (the Miner’s Welfare Park will be on your right). Access to The Civic Hall is off the High Street – you will be able to walk through from the car park, alongside the Library. From the M6 – exit the motorway at Junction 3 and, at the roundabout, take the B4113 to Bedworth/Longford. You will continue along a short piece of dual carriageway – at the next roundabout take the second exit to Bedworth (B4113). 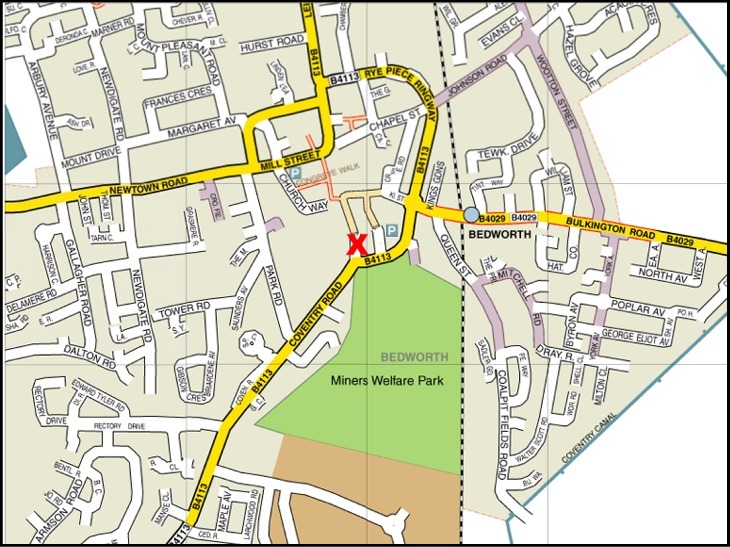 Continue along the B4113 until you reach Bedworth. At the mini roundabout (shortly after the traffic lights for Bedworth Leisure Centre) you will see The Civic Hall ahead of you, but this is a pedestrianised area – take the second exit (The Rye Piece Ringway) and then take the first left into Spitalfields Car Park (the Miner’s Welfare Park will be on your right). Access to The Civic Hall is off the High Street – you will be able to walk through from the car park, alongside the Library. From Nuneaton – take the A444 south out of the town, past the George Eliot Hospital, and continue until you reach the Griff Roundabout (you will notice the Beefeater and McDonalds nearby). Take the third exit, the B4113 to Bedworth and continue into town. At the mini roundabout (alongside the bingo hall) take the first exit (The Rye Piece Ringway) and continue past the traffic lights and straight over the mini roundabout. Shortly after the roundabout turn right into Spitalfields Car Park (the Miner’s Welfare Park will be on your left). Access to The Civic Hall is off the High Street – you will be able to walk through from the car park, alongside the Library. Satnav users should use CV12 8NF for main entrance or CV12 8HU for stage door and car park. There is ample pay and display parking in the vicinity of The Civic Hall. To the rear of the venue is Spitalfields Car Park and a short walk away parking can be found at The Miners’ Welfare Park and at Bedworth Leisure Centre.